As a record of each consumer’s credit history, consumer credit reports have become an integral part of the modern financial landscape. Each application for new credit, a new apartment, or even a new job can result in a lender, landlord, or potential employer making an inquiry to check your credit history. For consumer credit reports, two types of credit inquiries can be made, known as soft inquiries and hard inquiries. 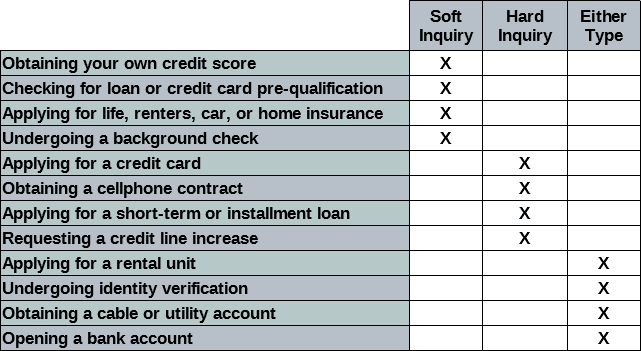 In general, a soft credit inquiry is performed as part of a background check, for credit card pre-qualification offers, or when you check your own credit. Soft inquiries do not require your consent and have no effect on your credit score. A hard inquiry, on the other hand, does require consent, as it will allow a lender access to your entire credit report. It will also be noted on your credit report and influence your credit score calculation through the new credit factor. Hard inquiries are used by creditors, such as lenders and credit card issuers, to assess your credit risk when you apply for credit. For the most part, hard credit inquiries will have only a small impact on your credit score, typically no more than a few points per inquiry. That said, as the number of hard inquiries on your credit report increase so, too, does the impact to your credit score. A series of hard inquiries in a short period of time can have significant impacts. On the plus side, hard inquiries won’t stay on your credit forever. Each inquiry can last a maximum of 24 months (two years) before it should automatically fall off your credit report. Additionally, negative marks on your credit report lose potency over time; this means that hard inquiries will have less impact on your credit score as they age. Beyond spreading out new credit applications to dampen the effects of hard inquiries, the informed consumer can avoid collecting inquiries in a few other ways, as well. To start, you can limit the risk of a fruitless hard credit inquiry when applying for credit cards by checking for pre-qualification (sometimes called pre-approval) offers. This process uses a soft inquiry, rather than a hard inquiry, which won’t impact your credit. You can also prevent the buildup of inquiries due to rate shopping for auto or mortgage loans by requesting multiple quotes within the same time period. FICO, for instance, will count all hard inquiries made within the same 45-day period for an auto loan, student loan, or mortgage, as a single hard inquiry when calculating your credit score. Of course, it’s likely counter-intuitive to many that your credit score is negatively impacted by hard inquiries at all, regardless of how long they last. After all, isn’t a creditor’s ability to check your credit kind of the point of consumer credit reports in the first place? The key thing to realize is that each hard credit inquiry represents at least the attempt to obtain new credit, if not the actual acquisition of it. In other words, hard inquiries can indicate your intention to take on debt in the near future, which increases your overall credit risk to potential lenders. Despite the fact that hard inquiries stick around for up to two years, the impact of those inquiries on your credit score will often pale in comparison to the other negative marks you can collect. For example, a single 30-day delinquent payment reported by your creditors can immediately drop your credit score 60 to 110 points, depending on your initial score. Furthermore, other negative accounts can hang around your credit report up to five times as long as a hard inquiry, as dictated by the Fair Credit Reporting Act. According to the FCRA, bankruptcy discharges, in particular, tend to stay on your report for a full 10 years. Other negative marks, such as missed payments and defaulted loans, are required to be removed after seven years. On the plus side, all negative marks, not just hard inquiries, will have less impact the older they get. This means a recent missed payment will have a much larger impact on your credit score than one from several years ago. While all negative marks — and their credit score impacts — are subject to age limitations, some accounts may fail to be automatically removed from your credit report. In other cases, out-waiting negative accounts may be an unappealing option, especially if you intend to apply for new credit in the near future. Whatever the reason for needing items removed from your credit report, you may have options for addressing any issues. Specifically, all accounts on your credit report must, by law, be fair and accurate representations of your credit. That means any information on your credit report that is expired, incorrect, or unsubstantiated can be disputed with the credit bureaus for removal. For many, the easiest way to deal with disputable credit report items is to hire a reputable credit repair company, such as our top-rated picks, to act on their behalf. When considering credit repair to deal with issues on your report, be sure to research your options carefully. This means understanding the entire credit repair process, including what to expect; not every type of negative account can be removed through credit repair, so do your homework. 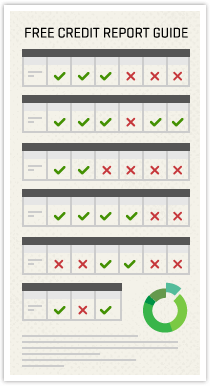 It should also be pointed out that the credit repair process is not always a quick one. While the bureaus and your creditors are required to respond to disputes within 30 days, many repair companies have limitations on how many disputes can be filed each month. Additionally, responding to a dispute is not the same as proving (or disproving) a dispute, and each dispute can take some time to fully reconcile. All in all, hard credit inquiries are an inescapable fact of financial life for the majority of consumers — but hardly one that should be of much concern to the average person. Indeed, those who are conscientious about how frequently they apply for new credit will be unlikely to see much of a credit score impact from their hard inquiries at all.